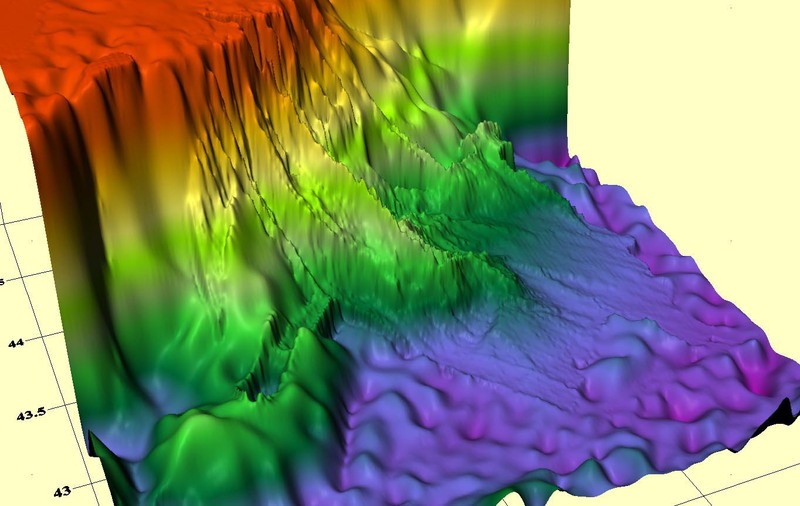 ARE THESE CONSTRUCTIONS OF UNKNOWN CIVILIZATION ON THE BLACK SEA BOTTOM? IS IT BASE OF ALIENS? IS IT ATLANTIS? 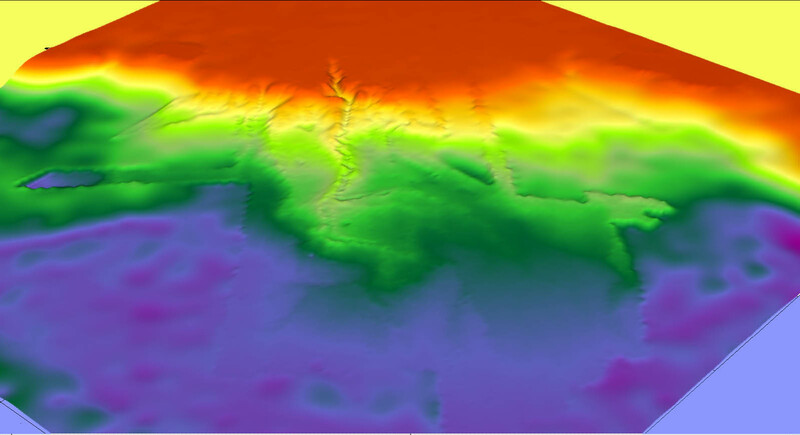 At the last time the researches of a deep-water part of Black Sea are caused the increasing interest. It was noticed that on a northwest array of depth falling there is a huge landslip (or series of landslips). 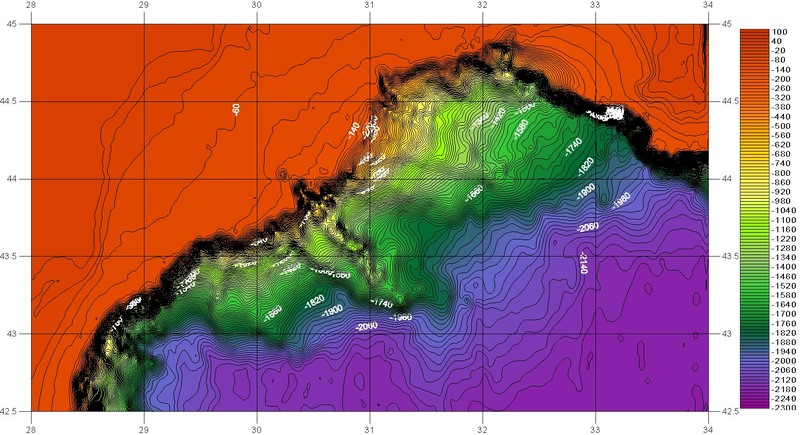 On the first figure we can see the result of modeling of lateral illumination of the Black Sea hollow. 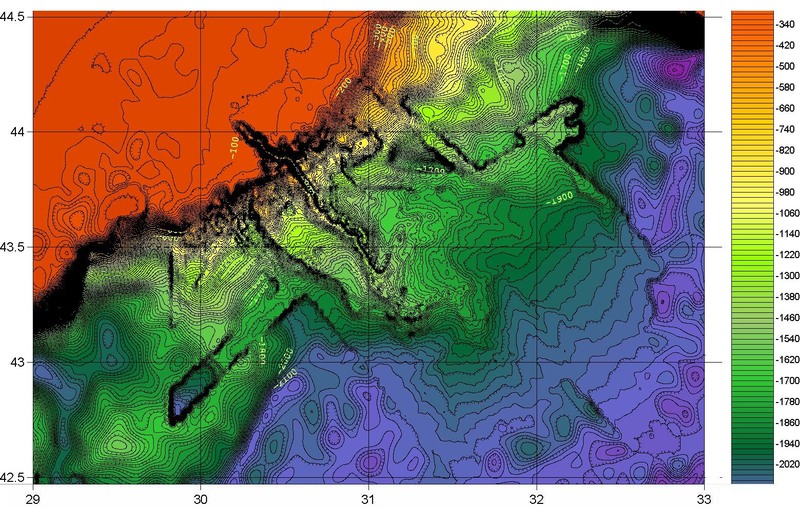 In this case data underlying maps of scale 1:500_000 (average distance between points of measurement depths of the order the10 kilometers) were used. It is possible to agree, that here the extensive landslip (system of landslips) really takes place. This conclusion proves to be true also data of the greater resolution. On figure1b lines of levels of depth function which is under construction on the basis of data of scale 1:200_000 are shown. The color scale conforms registered depths. However, data of a following level leads rather interesting - to additional conclusions. 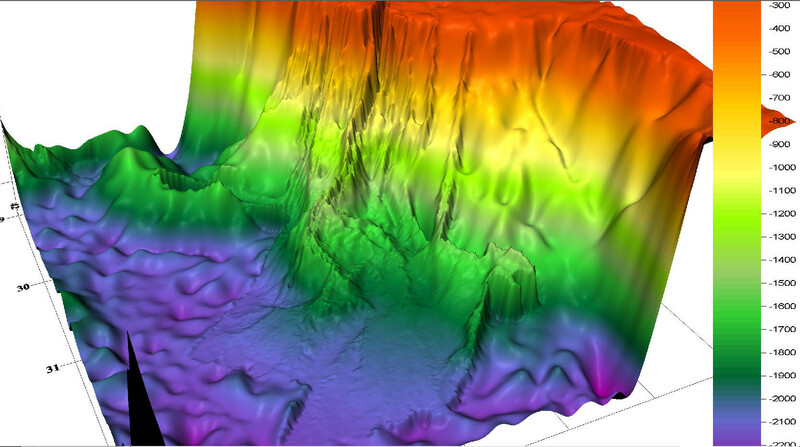 Such data are given by project ETOPO1 in the form of the table of depths. The step between the neighboring measurements is equal to one angular minute (that averages 1.8 km on a vertical - latitude). On figure2 the picture which has turned out on the basis of these data is shown. On the figure3a the axonometric projection of depth functions, with modeling lateral illumination (with the same deep coloring) is presented. On figure3b - a similar picture for other viewpoint. 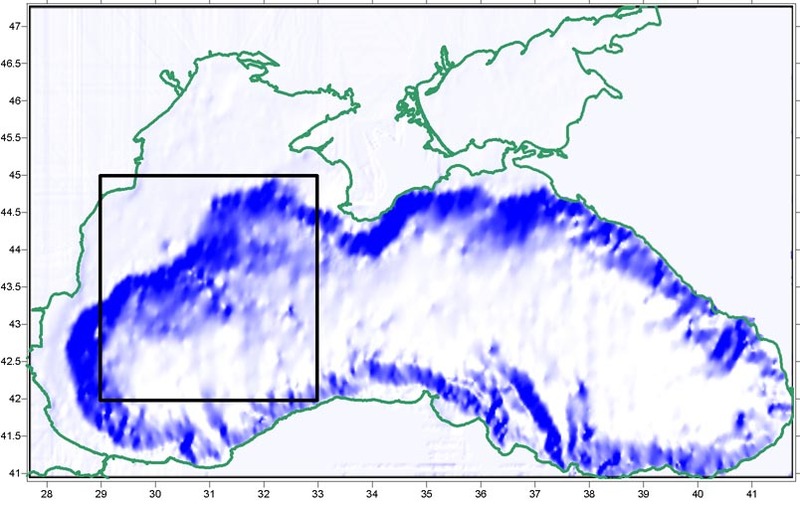 The data of project ETOPO1 have enabled to leave on qualitatively new level of the analysis - interpretations of the considered array of Black sea bottom. It is possible to notice, - if here and the landslip above it «someone has very strongly worked» took place. 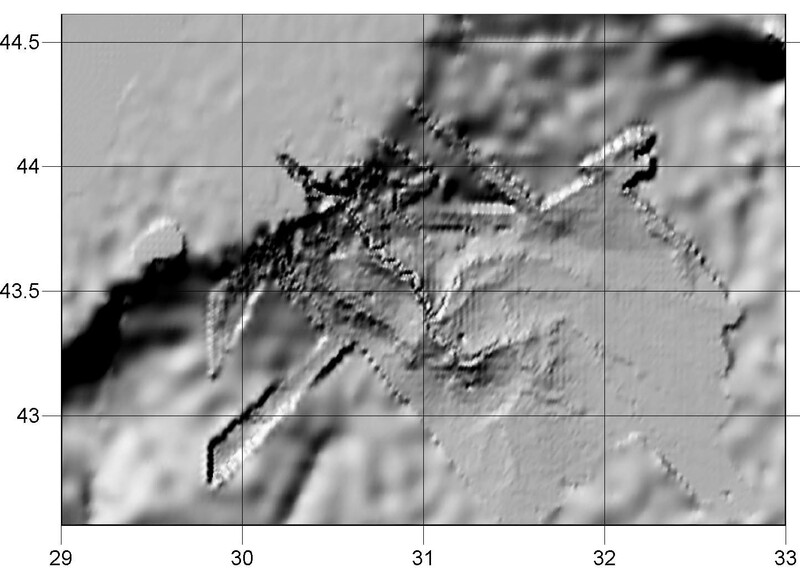 "Someone" has smoothed out bottom a landslip up to a plane with the borders which are looking like precisely expressed segments of direct lines, rectangular forms obviously approaching to formation. On figure4 the most obvious of similar pieces are depicted. On figure5 segments are presented separately. Here one of the most evident configurations - the basic configuration formed by 1,2,3,4,5,6,7,8,9,10 segments. There is a line «dredging - pockets» which images besides obviously approaching to the elementary geometrical forms. 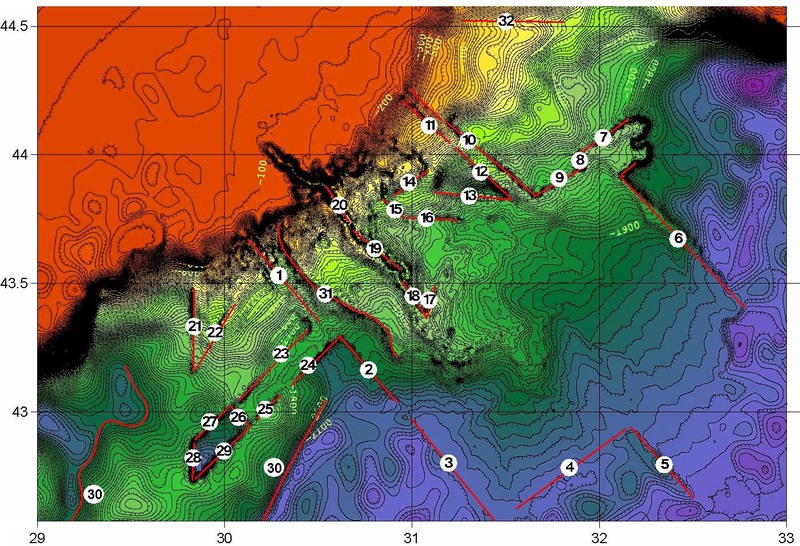 In this plan dredging - open pit «a starling house on one side» (segments 26, 27, 28, 29) with «overpass» (23, 24, 25) and emissions around (a curve 30 with obviously rectilinear site) is especially evident. 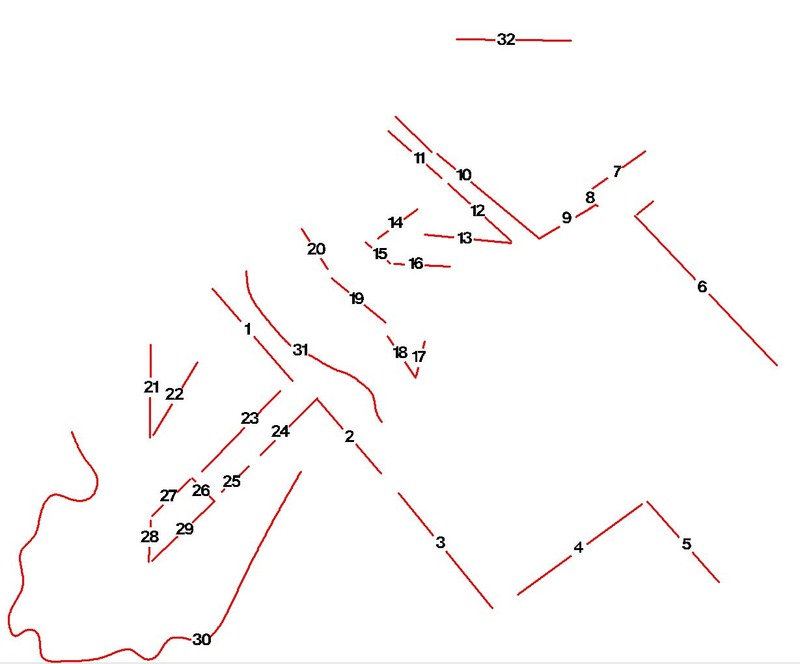 Besides here it is possible to rank and dredging on other side, designated by segments 8, 9, 10 and 12, 13, and also "corner" - 21, 22. And, at last, here there is a series of the ridges which are going down a shelf, with channels on top, with «undermined - cleaned» slopes that should not be at their cleanly natural origin. Similar - the elementary geometrical forms, within the limits of considered scales, are realized only by means of intelligence. On figure6 the observable picture on which depth is correlated with horizontal measurements is shown. Here there was less precise a border of a basic plane, and also some details. However, «the common plan» was more precisely showed. All this became more similar not on the cascade of natural falls, bat on certain «irrigational system». All this was presented as system «bypass» the channels located on «aqueducts». Mentioned «dredging - corners» have get «the back sides», and also - sense of certain stores. It was showed, that pieces 21 and 28 lay on one line. In this plan it is represented interesting to look simply shadow model - figure7. Probably, here not the landslip took place, but has broken away - the part of the top plate with results of its building (Atlantis?!). In favour of this version speaks an inclination of the smoothed out surface. If smooth out, then up to a horizontal. Though all this can be aqueduct for rise. Perhaps, the landslip and scabbing took place also. All this could occur stage by stage. Inhabitants struggled, while them has not filled in finally (the Flood?!). It is represented rather interesting to scan - "to comb" all this area, or even its separate parts, with devices and technologies of the greater resolution.